Ever gone fishing? Well, whether or not you’ve been fishing before, one thing that you should always know is that the importance of the best saltwater spinning reel should not be overlooked. The problem, however, comes in when shopping for one. At times, this can prove to be quite a hassle even for the experienced anglers. Over the years, the spinning reel has been one of the most priced equipment for most anglers and each one of them would like to get their hands on the saltwater spinning reel. When making your purchase, you should take a lot of things into consideration such as the species you are interested in. Something else that will dictate your choice is the fishing method as well as the level of experience you have- are you a beginner or an expert? That being said, we’ll be looking at some of the things you should take into account before getting a saltwater spinning reel. In addition to this, we’ll also look at 10 of the best. Let’s get to the details then, shall we? Having had a look at most of the important things you should take into account before making your selection, let’s now move on to looking at 10 of the best. Starting us off on our list is the Penn Battle II spinning rel. well, if you are looking for the best saltwater spinning reel under 100, then this one’s definitely it. For starters, it comes with a full metal body as well as the side plate and the rotor. Other than these, the aluminum wire on the bail ensures that you get utmost durability. When it comes to conquering the big saltwater fish, this one should not disappoint you whatsoever. 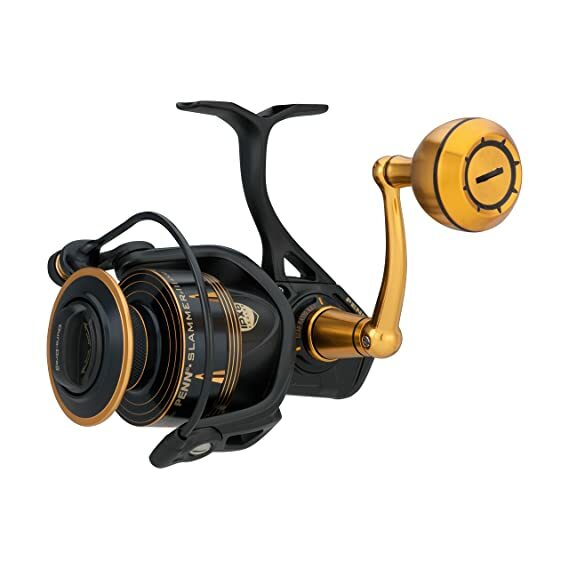 The reel comes with a fluid or rather a smooth cranking system and more so has got 5 sealed stainless steel ball bearings which ensures that everything moves smoothly. Speaking of the bearings, it is also worth mentioning that there is one anti-reverse bearing that gives you a better hookset. When it comes to this, the HT-100 drag system just so happens to be one of the best you could get out there. This ensures that the drag system is smooth even under heavy loads. This, in the long run, ensures that you get both the power and finesse when going up against the fish that are hard to pull. So as to give you utmost durability, each drag washer is treated with a proprietary grease. If you’re all about quality, then this saltwater spinning reel will definitely blow your mind. Let’s have a quick look at what it packs under the hood, shall we? Starting with the drag system, it boasts to have the HT-100 Slammer drag. Well, as far as getting a smooth drag is concerned, this should definitely serve you well. The outstanding drag range gives you the necessary power to be able to dominate over a variety of fish. In order to ensure long-lasting performance, each drag washer has been treated with a proprietary grease. Comes with 5 stainless steel ball bearings. What these do is ensure you have the cranking as smooth as possible when reeling in your catch. In addition to this, there is one anti-reverse bearing that helps eliminate rotor back play. Simply set the hook and reel in your catch without a fuss. Durability is not overlooked as well. To keep the Penn Spinfisher V Fishing Reel going for as long as possible, it comes with a full metal body construction as well as watertight frame seals all around the drag system- definitely the best saltwater spinning reel. On the spool are line capacity rings marked at both 1/3, 2/3 and the full capacity. This way, you can be able to see how much line is remaining on the spool at a glance. One of the most important things when choosing a saltwater spinning reel is the level of durability on it. 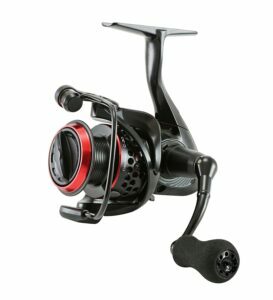 So as to ensure this is the best, the reel features black anodized machined aluminium housing. This simply includes the hard boyz body and the side cover. As for the gear ratio, it is an outstanding 6:1. The higher the gear ratio the better off you are when it comes to reeling in your catch faster. As for the bearing count, the Daiwa BG Spinning reel comes with the 6+1 bearing count. This implies 6 ball bearings and 1 roller bearings. When it comes to releasing the line or reeling in your catch, the 6 ball bearings ensure that this happens smoothly. The 1 roller bearing on the other hand functions to give you an infinite anti-reverse system. Besides being only smooth, the drag system is also waterproof. This simply ensures that you get to use the reel for as long as possible. Summing up it is worth mentioning that this spinning can be used in both saltwater and freshwater and offer the best convenience all the same- definitely the best saltwater spinning reel under 100. When it comes to quality and performance, Shimano is reputed for always delivering the best products. That being said, let’s have a look at what the Shimano Stradic Ci4+ FB is all about, shall we? First off, let’s have a look at its construction. So as to ensure you get to have a lightweight experience when using the reel and also have the rigidity maintained, the reel is constructed of lightweight carbon materials. In addition to this, so as to give you an even better experience, the reel comes with a G free body. This functions to balance the entire reel by centering all the internal components. As for the gear system, the Hagane gear that is produced by the cold forging process ensures that the durability and strength of the main gear on the reel are at its best. So as to prevent any corrosion or rusting of the internal components, the Coreprotect feature is incorporated on the reel. This ensures that you have less to worry about when it comes to maintenance. As for the gear ratio, the Shimano Stradic comes with a 5:1 gear ratio which makes reeling in your catch much easier, comfortable and fairly fast as well. We’re already halfway on our list and we’re doing good so far. 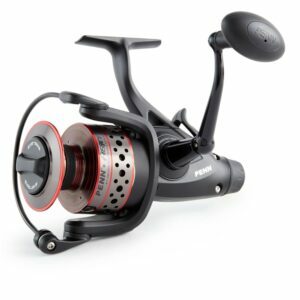 Coming up 5th is the Penn Fierce II Spinning Reel. Let’s see what it’s got in store for us. Starting with the bearing count, it comes with 4+1 shielded and stainless steel ball bearings. The 4 ball bearings allow you to reel in your catch quite easily and in addition to this, the remaining one bearing acts as an anti-reverse. This simply means that you can have a better hookset to make your angling much easier. 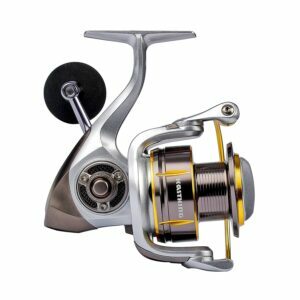 The reel comes with a die-cast aluminum body and side plate construction. The two of these are quite durable. Also, other than just being durable, they also ensure precision in gear alignment at all times even if your line is under heavy duress. There are also the line capacity rings on the spool that allow you to know the amount of line that’s remaining in the spool at a glance. This is made of heavy duty aluminum which ensures that durability is not compromised whatsoever. When it comes to pulling in the large gamefish, this one’s definitely the best. If you’re on a budget but want to have an outstanding spinning reel, all the same, you should definitely consider getting your hands on this one. Being one of the most important things in angling, it’s important that the bearing count gives you nothing if not a smooth experience. So as to make this possible, the Okuma Ceymar comes with 7 ball bearings with one roller bearing on top of these. The 7 simply ensure that everything is smooth when reeling in your catch and the extra 1 acts as an anti-reverse for the handle for a better hookset. The drag system is a powerful multi-disc drag. This simply keeps things going smoothly when reeling in your catch. Something else that’s worth pointing out is the rotor system. This reel features Okuma RESII Computer balancing hence Ceymar spins without creating any wobbles even at the highest speeds. The handle arm is forged by aluminum which makes sure that you get utmost control over the reel. The Eva handle knobs, on the other hand, give you maximum comfort and grip as well. The blade body design of the reel reduces unnecessary bulk and minimizes the overall size and weight of the reel so that you’ll only be focusing on your catch. We’re already past halfway on our list. Coming up 6th, we’ll be looking at what might just be the saltwater spinning reel under 100. Let’s get to it then, shall we? 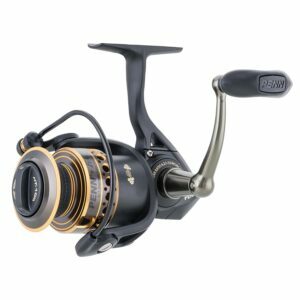 The smoothest angling experience- one of the features that make this reel unique as compared to others in its class is that it comes with 10+1 bearing count. 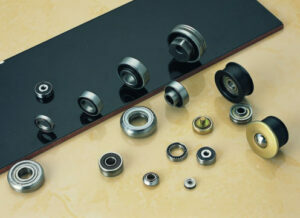 The bearings will definitely give you a smooth experience. Other than just being smooth, they are shielded stainless steel ball bearings to ensure you get utmost durability at the same time. Built to thrive in saltwater- the spool is made of aluminum which is both durable and hardly gives in to corrosion. The same goes for the rotor structure which also prevents sand and water from getting in- both lightweight and amazingly strong. The aluminum body construction keeps all the internal components intact hence no matter how rough the struggle is; the reel will not come apart. The bail wire on the reel avoids any line breaks and being it’s thick, you get to have a smooth and fluid drag support. The roller design is outstanding as well and is meant to reduce line twists as well as fatigue. If you’re shopping for the saltwater spinning reel under 100, this one should not miss out of your list. Here’s what it packs under the hood. First off, it comes with a narrow graphite frame design. As far as performance is concerned, this may just be what you need when it comes to having the best experience in saltwater fishing. Besides being corrosion-resistant, it is also quite light hence you won’t have to worry about forearm and wrist fatigue. The drag system is outstanding as well. With the KastKing Summer, you’ll have nothing but an intensive and strong drag power. On the spinning is a strong CNC machined aluminum spool. Other than being lighter and stronger, you get to have more even line lay. The internal grooves on the spool give it better lube retention and you get more fishing line capacity as well. When it comes to the construction, you get both a lightweight and durable frame. The body construction is made entirely out of graphite, there is a metallic side plate and in addition to these, there is a graphite rotor that is able to deliver long-lasting durability. There is no excess bulk on this reel hence the balance, sensitivity and durability are optimal. As for the drag system, the reel’s oil felted drag system is able to deliver a smooth yet forceful drag performance. Other than this, there’s the thick aluminum bail wire that gives the spinning reel additional leverage and strength. On the reel is also the anti-reverse bearing. This one simply gives you a better hookset by holding the line in place hence giving you a better and easier experience when reeling in your catch. The cranking system is also smooth and comfortable which means that handle playback will be kept to a minimum. As for the handle, it comes with an ergonomic one that proves to be comfortable all through your angling session. 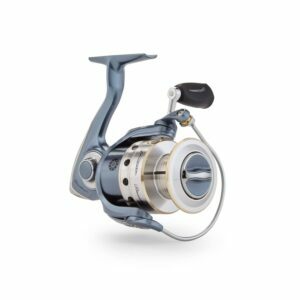 Coming last on our list is the Pflueger President Spinning Reel. For any angler, there’s nothing as good as getting an all-around spinning reel. This reel proves to be a durable choice for both casual hobbyists and the seasoned anglers. The bearing count- this is one of the features that make this spinning reel worth every dime you spend on it. It comes with an outstanding 10 bearing system whereby 9 of these are corrosion-resistant stainless steel ball bearings. These simply make things smoother when it comes to turning the handle. The remaining 1 ball bearing is the anti-reverse bearing which gives you better control when turning the handle and bringing in your catch. As for the construction, it comes with an aircraft-grade aluminum handle which is both strong and corrosion resistant. As for the rest of the reel, the body and rotor are both made of graphite hence keeping things both light and durable. The graphite construction also does give the reel the best responsiveness without compromising rigidity. In the long run, you end up having a long-lasting reel that doesn’t flex or give in whatsoever no matter how intense the struggle is. The drag system is stainless steel and oiled felt. This simply delivers a smooth and consistent drag pressure. The spool, on the other hand, is braid-ready hence allowing the braid to be tied directly to the spool. Which Species Are You After? When it comes to fishing, one of the most overlooked factors is the target species. As a matter of fact, as far as saltwater fishing is concerned, most people go about shopping for a reel because of its build quality and tend to overlook the species they’re interested in. when it comes to the species, what we are mainly concerned about is the size as well as where each of them lives or rather the natural habitat and finally the season. Whereas some fish prefer to dwell offshore, others will find the areas with mangrove or water weeds more suitable. In either case, you’ll need to have different fishing reels. Simply put, in order for you to tackle the different species, you’ll need to be ready with the best fishing rod as well as reel at your disposal. Is The Cost Really Relevant? Something else that tends to raise some concern is the cost of your saltwater spinning reel. If you are making your purchase for the first time, then this is definitely something you should take into consideration. In most cases, as a beginner, you’ll go for an entry level saltwater spinning reel. Don’t spend too much on it since it’s your first and doesn’t know how long you’ll be using it. As a matter of fact, if you just take your time and look in the right places, you can get your hands on the best saltwater spinning reel under 100. On the other hand, you shouldn’t be too mean if you want something that leans more towards quality. 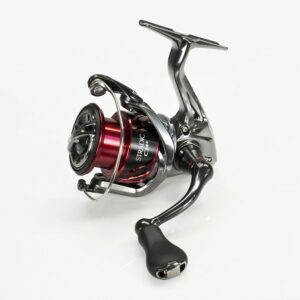 In most cases, quality saltwater spinning reels will be able to stand up to harsh conditions and at the same time, they’ll put up with the struggle no matter how heated up things are. Something else to take into account when making your purchase is the quality of the spool on your fishing reel. Since you’ll be going salt-water fishing, it is best that you consider getting something that will not give in to corrosion easily. When it comes down to the spool, you’ll have to choose between graphite or aluminium in most cases. For anyone looking for an entry level spinning reel, it is definitely best that you go for one that’s got a graphite spool on it. The assumption here is that you won’t be spending a lot of time in the waters and you’ll be learning to use the reel. Graphite spools are normally cheaper and lighter as compared to the ones made of aluminium. The bright side of having the graphite spools is that since they aren’t made of metal, there won’t be any corrosion. When you choose to settle for aluminium, you should definitely be ready to spend some extra cash as well. Aluminum spools are heavier and more durable. Want something that lasts, it is best that you go for the spools that come with an anodized finish or alternatively a machined bronze aluminium spool so as to minimize corrosion on them. Even though you may be having the best and most durable spool, you should always clean it up after use so as to maintain its top performance. When it comes to saltwater fishing, most of the fish we’ll be dealing with will definitely put up a struggle. There’s nothing as annoying as when the speed with which you are reeling in the fish is too slow. If this is the case, what happens is that you end up being unnecessarily fatigued. You don’t want to spend more time than you ought to in the waters, right? Well, so as to ensure this does not happen, it probably bests that you get a spinning reel that has got a fairly high gear ratio. What the gear ratio simply does is determine how comfortable you’ll be and how tired you’ll get all based on how fast you can retrieve the line and the amount of pressure you’ll be using while doing so. For the lines that have a low gear ratio, you’ll enjoy more power but at the same time, you’ll reel in the line much slower. As for the spinning reels with a high gear ratio, there’s less power but the line retrieve rate is much faster. Taking into consideration the species you’ll be going after, you should know what’s best for you. If you’re lucky, you can get the best spinning reel that allows you to switch between the high and the low gear ratios. If this is the case, you’re in luck since you’ll get to enjoy utmost flexibility while doing your fishing. As for the bearing count, the higher it is, the better off you are. 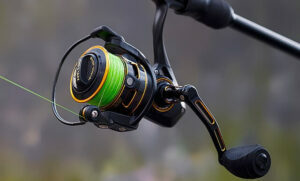 What the bearing count does is that it determines how smoothly your reel is able to operate. You may not appreciate the significance of the bearing count until you end up being caught in a struggle with the fish. Still, at the bearing count, something else that’s relative to both the cost of the reel and its performance is the quality of the ball bearings. 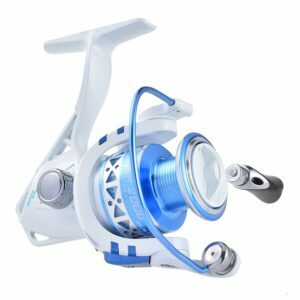 If you want your spinning reel to fare well in saltwater, then you should go for the ball bearings that are corrosion resistant. If you want the best, you should take your time to look at its construction. 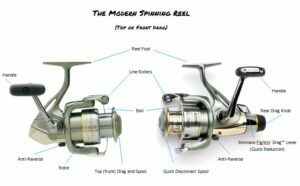 The common goal for manufacturers when it comes to the construction is that all of them have been working towards coming up with spinning reels that are light enough to allow for a long cast and strong all the same. 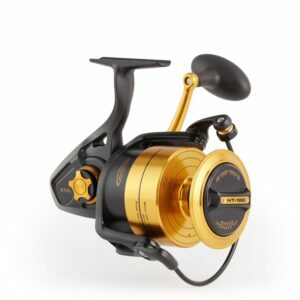 Most of the reels that go at a mid-range price will come at an all-metal body construction whereas the high-end reels will incorporate strong and lightweight metal alloys. In some cases, so as to cut down on the weight, some of the machine portions are drilled out. If you are on a budget, you could go for the cheaper options. So as to save the weight and make them cheap as they are, what the manufacturers do is include small plastic or graphite pieces to the reel’s construction. These are designed to be strong enough to hold up in the strain when it comes to battling bigger fish. Even though the reel may not come apart during the struggle, the bearings within it may be a little bit loose. What Type Of Machining Does It Have? As far as the price and quality of the reel are concerned, the type of machining on it should not be overlooked whatsoever. Depending on how frequent you go angling, you can weigh out whether or not it would be best if you went for something that’s expensive. Tighter tolerance machining since you get to have bearing seats of a better quality and in addition to this, they are less wobbly as well. Cranking is smoother and in overall, all the internal components of the reel tend to last longest. Something else to take into account if you want the saltwater spinning reel is the drag system that comes with it. In all spinning reels, you’ll have either the front or the rear drag system. Upon deciding the species of fish that you are interested in, you can then go ahead and choose the best reel that’s going to give you the easiest time possible. In most cases, the front drag system is rendered suitable if you’re after the big fish this is so because the front drag system is of a higher quality. The front drag is positioned at the top of the reel. If you are a frequent angler and are really serious about angling, then this is what you should go for. The rear drag system, on the other hand, is most suitable if you’re using the spinning reel for the first time. Even though it’s of a rather lower quality, it is easy to adjust the line- it’s not that bad to start with this one, is it? What Is The Maximum Line Capacity That Can Be Handled By The Reel? When it comes to fishing, regardless of whether you are into freshwater or saltwater fishing, line capacity is quite important. Regarding the species of fish, you’re interested in, you’ll have to know the type of line to have. The best thing about spinning reels is that they are designed to make fishing as easy and comfortable as possible. As a matter of fact, spinning reels can handle as little as 2-pound test weights allowing you to cast very light lures. If you’ll be going after larger fish, you’ll have to go for heavier lines and be ready to bear the burden that comes with the weight as well. In the spoon is the indication of the line capacity and it is highly recommended that you observe not to go beyond this. For example, if you were to use a small diameter line on a reel with a large spool, there’s a high possibility that you’ll end up with tangles. On the contrary, putting a line that’s too heavy on a smaller spoon may result to stiffness which can be quite irritating. The advantage of having a lighter line is that you can cast your lure at a long distance. A reel with this is definitely the best inshore saltwater spinning reel since you’ll be able to cover more ground. On the other hand, lighter lines are not the best if you’ll be doing your fishing inshore where there’s more cover. In this case, you’ll need a heavier line that’s going to fare well against the abrasive action of the rocks. 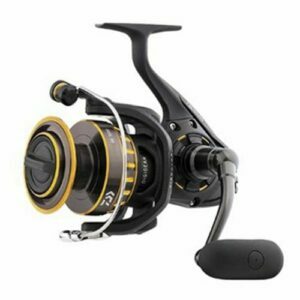 Normally, the best offshore spinning reels will have high capacity spools and in addition to this, they’ll come with a high gear ratio. The reason for this is for you to be able to withstand the struggle and considering the lines are more durable, the drag is heavy duty. The best inshore saltwater spinning reel will have two gear sets hence you can choose between fast retrieve and a low gear ratio to fight the fish. Convenience or rather a comfort is something else that should not be overlooked whatsoever. When it comes to saltwater fishing, the ground to cover is vast and there’s a high possibility that you’ll spend a few hours in the waters. Though it’s not something that you’ll find every day, the solution to this is getting a spinning reel that’ll allow you to switch between your right hand and your left hand. If you have one dominant hand to do the reeling while the other does the casting, there’s no need at all to go for the switchable saltwater spinning reels. 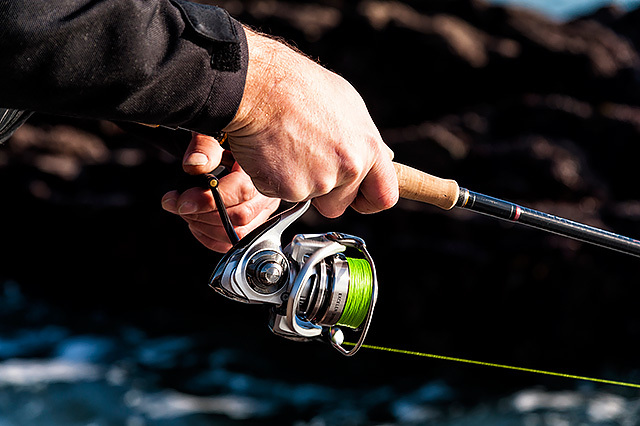 Speaking of comfort, one more thing that most manufacturers fail to take into account when designing the spinning reels is paying attention to the handle. As much as it may be switchable from your right hand to your left, it would be annoying if you were to do this every few minutes, right? How’s The Bail On Your Reel? Ever wondered what releases the line and wraps it around the spool of your reel? Well, all this is simply done by the bail. When it comes down to you having to select your spinning reel based on the mechanism of line release, there’s a lot to consider. First, there’s the system that we’re used to- where you have to hold the line with your forefinger and open the bail with the other hand and then there’s the mechanism that works in such a way that there’s a trigger that can be used to release the line. Other than these two, there’s a more advanced option- the Quantum Hypercast Ultra. No matter what position the bail is at, it’s accuracy is not compromised whatsoever. The unique mechanism of this type of bail allows you as the angler to do the casting without touching the line at all which comes in handy if casting in the traditional matter is challenging. The hyper cast has got a trigger that sets in motion a mechanism that is able to hold the line till you release the trigger. 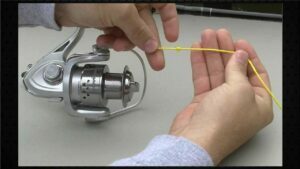 Even though there are a lot of benefits to using a spinning reel, there are also some issues that you have to be ready to deal with one of the major ones being line twists. Line twisting occurs when there’s a twist in the line as it wraps around the spool. It normally starts small and after repeated casts, there may be a huge tangle around the spool. There are however innovations in place to take care of this such as the use of a swivel, the use of a slick system on some spinning reels or employing the use of ball bearings. In some cases, using specific metals such as titanium when construction the bail helps minimize this. if you’re getting your first reel, you should probably go for the reels with a larger spool since this help to reduce line twists in most cases. Which Type Of Handle Does It Have? Other than just being comfortable, there is more to the handle. Whether you are looking for an entry level saltwater spinning reel or you’re already an experienced angler, it is best that you go for the anti-reverse handles. Think of a scenario where you’re reeling in your catch and as you turn the handle anticlockwise, your catch momentarily overpowers you and the line unwinds hence you have to start over again. Quite annoying, right? So as to avoid such situations, the anti-reverse handle is definitely what you should go for first. The handle doesn’t slip backwards hence you get to have a better hookset in the long run. Does It Come With An Extra Spool? One of the best upsides of having a spinning reel is that you’ll be able to change the line with utmost ease. If the reel comes with an extra spool, you can fill the extra spool with another line. Rather than having to get another reel-rod combo, all you’ll have to do is simply change the spool and you’re good to go. You can load the extra spool with a heavier or lighter line for flexibility purposes. All things considered, fishing using a spinning reel is quite a simple process. It basically involves casting your lure to the water and reeling it in. If you’re doing it for the first time, you may have a little bit of a problem with your aim but you’ll get it right after a while. Truth be told, you may not be able to tell the difference between a high-quality reel, a mid-range or a low-range one at first. Over time, however, the little things will lead you to get the best saltwater spinning reel. Even if it’s your first, ensure that all the components are of the best quality. You should also try to match you spinning reel with the perfect line and don’t forget to observe the line capacity as well. Where is The Best Place to Shoot a Deer kill in One-Shot?